Karaganda State University, specialty «Chemistry » 1980-1985 yy. 1995-2008 is a leading researcher in LLP RPF «Казантикор». 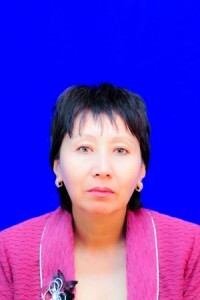 2008-present – associate Professor of the Department «Construction materials and technologies» of the KSTU. «Waterproofing materials», «Concrete aggregates», «Heat-Insulating and acoustic materials», «Resource-Saving technologies of building materials», «Anticorrosion and fire-resistant building materials», «Physical and chemical methods of analysis», «Finishing materials», «Modern materials in design», «Advanced technologies of building materials and products». Труды Университета №4, 2018 г. Исследование причин с водообразования бункеров. Obtained innovative patents: № 24549, 24550, 24551, 25081.